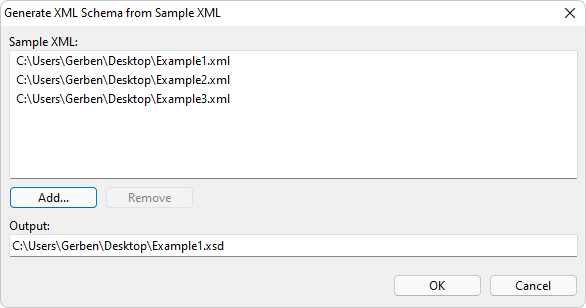 To generate an XML Schema (XSD) from sample XML select Schema > Generate XML Schema from Sample XML... to open the Generate XML Schema from Sample XML dialog. You can add multiple XML documents. XMLBlueprint will automatically generate a location for the XML Schema that will be generated, but you can adjust it to your needs.